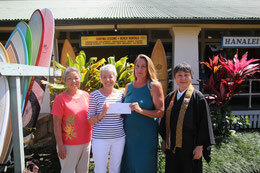 Wes Perreira, the Hawaii Foodbank Kauai Branch manager, left, and Michelle Panoke, the Hawaii Foodbank Kauai Branch office manager, right, accept a contribution of $5,000 and 130 pounds of food from the Honpa Hongwanji and the Lihue Hongwanji Mission, represented by, from left, the Rev. Arthur Kaufmann, Gail Shibuya and Carol Valentine, Wednesday morning at the Hawaii Foodbank Kauai Branch warehouse in Puhi. Carol Valentine of the Honpa Hongwanji Social Concern Committee said the contribution is done “as needed,” Wednesday during a presentation to the Hawaii Foodbank Kauai Branch. 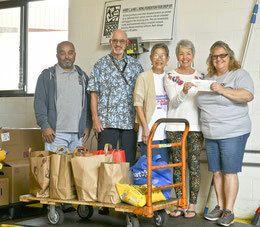 In addition to the cash donation, members of the Lihue Hongwanji Mission turned over 130 pounds of food from a month-long food drive conducted in February. Michelle Panoke, the Hawaii Foodbank Kauai Branch office manager, was impressed with the generosity of people to help others who need help. L-R: Roberta Yanagawa, President of Kauai Hongwanji Council; Carol Valentine, Social Concerns; Hana Neerings, Malama Kauai/Mea`ai on Wheels; Rev. Mieko Majima, President of the Kauai Ministers Association.